When Nami from Just One Cookbook posted this recipe on her blog, I knew I have to make these yummy little treats. This is a very simple icebox cookie recipe – icebox cookies are cookies made from a dough which has been refrigerated or frozen. The cooling or freezing makes the dough stiffer, enabling the dough to be sliced thinly. Sesame seeds are small oily seeds commonly used in African, Asian, and Middle Eastern cuisines. Sesame seeds are pretty nutritional, containing calcium, iron, copper, magnesium and phosphorus. There are two types of sesame seeds in the market – white and black. White sesame seeds are lighter and a little sweeter in flavour while the black one is more smoky in taste, and both have been used in sweet and savoury foods. These cookies are a combination of sweet and savoury which may not appeal to all (not all of my friends are very fond of the cookies). I, however, really love these cookies for their unique taste, and just couldn’t stop once I start eating one! The cookie dough is really easy to prepare, though I didn’t use Nami’s method as I don’t have a large food processor, so I used the traditional creaming method instead. 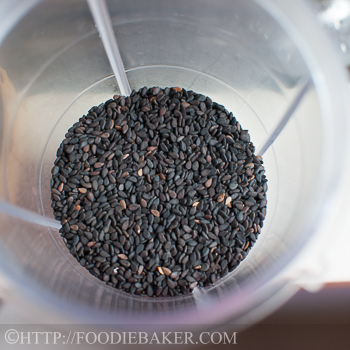 1) Grind some sesame seeds in a food processor. 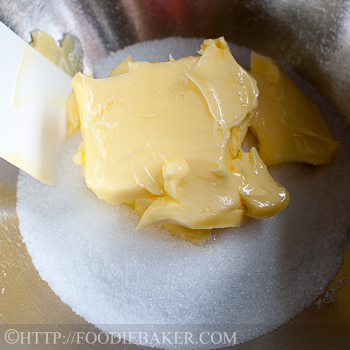 2) Cream the butter and sugar until light and fluffy. 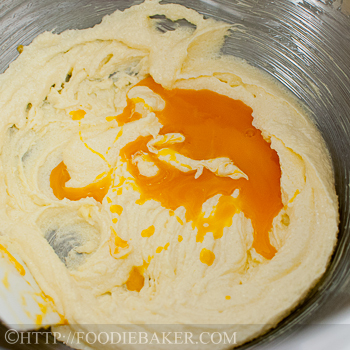 3) Add in egg yolk and beat it in. 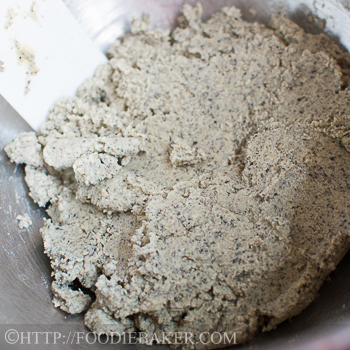 4) Add in the ground black sesame seeds. 5) And some almond meal, flour and salt. 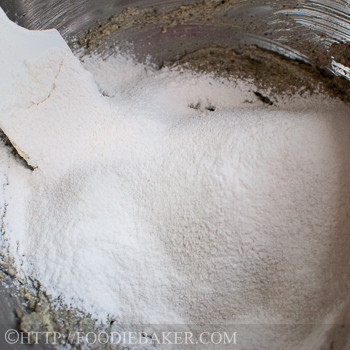 6) Mix until a dough forms. 7) Shape the dough into a log. Refrigerate for at least and slice into cookies. 8) Bake until the edges are lightly golden brown in colour. Thank you, Nami, for the recipe! If you’ve tried these cookies, let me know what you think of them! Divide the dough into two (so that it is easier to handle). Turn out each dough onto a large piece of plastic wrap. 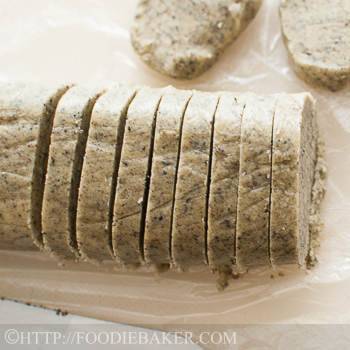 Shape the dough into a rectangular / squarish / round log with the help of the plastic wrap. I shaped my dough to be about 1.5-inch long in length. Refrigerate the dough for at least an hour (I left mine overnight). Pre-heat the oven to 175 degrees Celsius. Line a baking sheet with baking parchment. Keep the cookies in the air-tight container for up to 5 days. This is my first time baking with sesame seeds as well, and it turned out really well and delicious! Thank you Amelia! A batch of these cookies are sent your way 😉 have a great week ahead too! Hi Nami, thank you for the compliments! Thank you for sharing such a wonderful recipe with us, love it! Me too, Joyce! I love bread with sesame seeds on top. Feel like baking some bread soon! Thank you for the compliments, I think a pot of tea would be really nice! Can’t wait to see your baking recipes! I love sesame seeds on bread too, they add crunch and so much flavour! 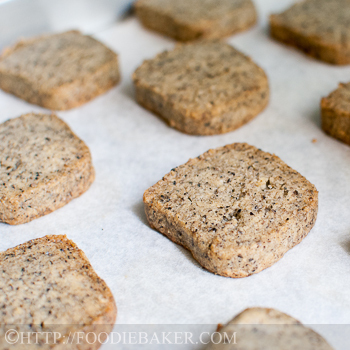 White sesame seeds (or a mix of black and white) can be used too, I’m glad you like them! I’m sorry to hear about your failures! Yes I think not everyone will like the taste of the sesame seeds, so I think a variation can be a vanilla version, and sprinkle some sesame seeds on top before baking for the crunch and flavour! Hi Jasline, this cookies look very addictive. Yours look very nice. Love the last picture, can I have that stack with coffee. ^-^ Have a wonderful week ahead. I like ice box cookies (and cakes!) 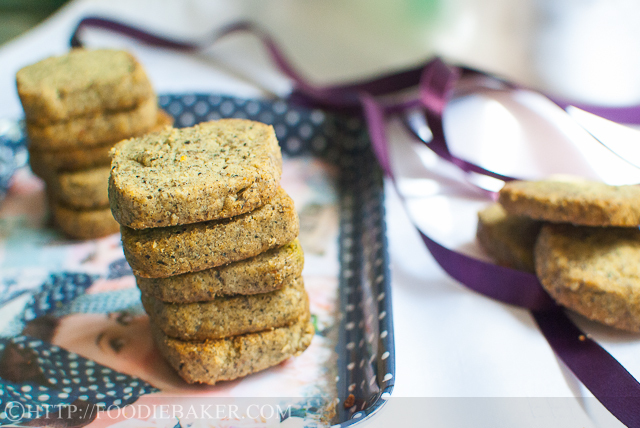 These look delicious with black sesame seeds. good morning jasline, i dont really know what icebox means tho i heard of it, thanks for the explanation. 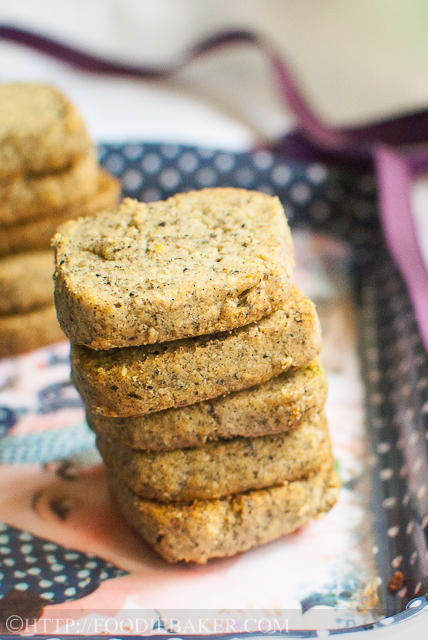 quite fond of black sesame be it seeds, paste or powder ..i’m going over to nami’s blog and take a look at her cookies, have a good week! I love sesame seeds especially in breads! Usually, I would use the white sesame seeds, though I don’t mind black ones as well. These cookies looks wonderful, would be great with a pot of Chinese tea! 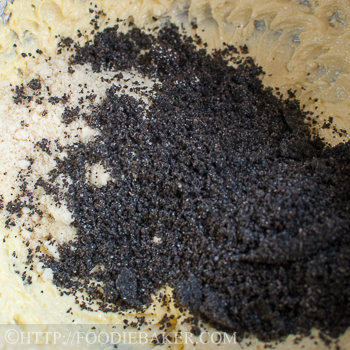 I have not made any cookies using black sesame seeds before. Thanks for sharing, have a lovely weekend! I must admit, Jasline that I’ve not had either typ of sesame seed in great quantities. I’ve used the light atop bagels and bread rolls but that’s hardly the same thing. I love the ease of an icebox cookie, though, and I’ve got the sesame seeds. There may be some baking in my future. 🙂 Thanks! Their beautiful Jasline, I love the contrast of the black sesame seeds and tender blonde shortbread. I imagine they would be fantastic with a cup of tea. Just know I would love these, especially as I like sesame seeds. Although, I’ve never tried the black. I’m one of those people who find black sesame seeds very smoky in flavour. I can take it in small quantities, like the sesame seed brittle I made some time ago, but I’m uncertain as to a cookie whose main flavour is these cookies. Especially in such a delicately flavoured cookie like this shortbread. 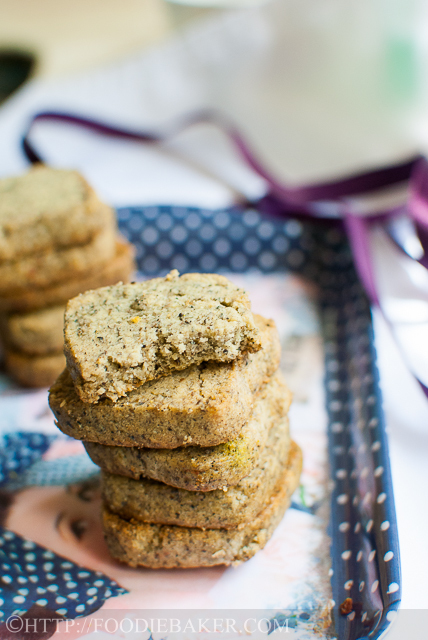 That said, they look very pretty and remind me of the matcha and white chocolate chip shortbread cookies Nami made a while back. Unfortunately, it was another of my baking failures.